I recently paid a visit to Baltimore to photograph some of the surviving architectural commissions of my great-grandfather Edward Hughes Glidden. I had a great time traversing the city, from Battle Monument Square to Druid Hill Park, from the financial district to South and East Baltimore, and then out to Johns Hopkins’ Homewood campus, Roland Park, and Guilford. Some of Glidden’s buildings have fallen into disrepair – the Seventh Baptist and Second German Evangelical Churches are sad examples – while others are evidently well cared for and even loved. 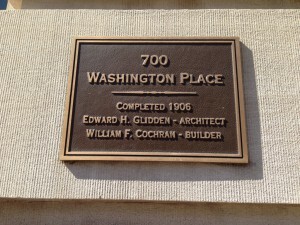 Best of all, on my first morning in the city I photographed the marker at the entrance to the Washington Apartments (1905–6) on Washington Place, where Glidden and his patron William F. Cochran are still memorialized. 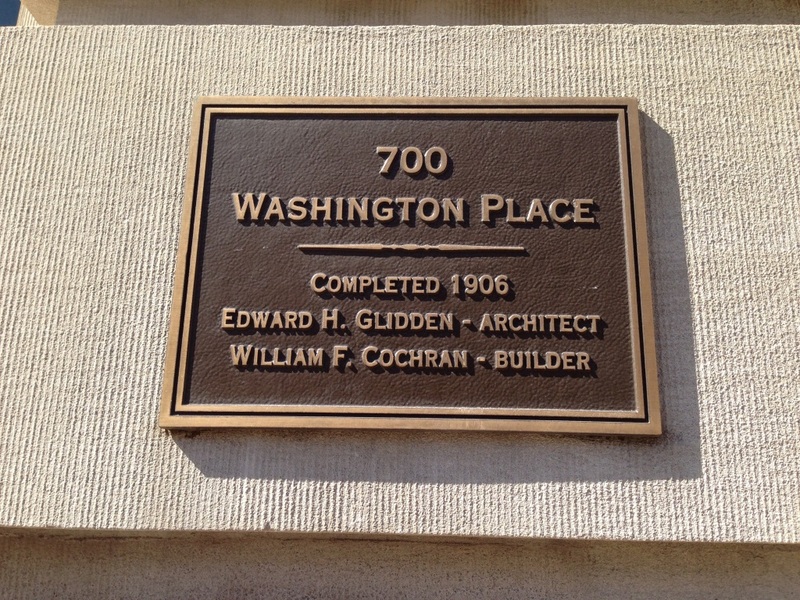 Before I left on my trip, I felt fairly confident that the photo I posted back in February – of a prosperous man in overcoat and spats walking in front of the Homewood Apartments – showed Glidden at a building which he had designed (with Clyde N. Friz) and in which he lived and died. There was a nagging doubt about that identification, however, which grew during my stay. This weekend, at my parents’ house, I found my mother’s picture. This man is somewhat younger, with a neat beard and thinning hair – and a pince nez. The good news is, Wincy and I each seem to have a photo of the same man, passed down in our respective families, and kept for more than ninety years. He is unidentified on either picture, although Wincy’s has a code on the reverse, one perhaps deriving from Baltimore’s Bachrach Studio, which reproduced another, older image. I can remember finding my mother’s copy years ago. Unlike so many of her family photos, it was unmarked, which led me to wonder who had preserved this photo, and why. All in all, this situation makes me fervently wish that someone – my great-grandmother, say, or my grandmother or great-uncle – had scrawled an EHG on the back of one of these photos! It’s an object lesson for all of us: It is all too easy to lose track of the identities of people we care about, which makes it all the more important to annotate our photos and mark our possessions for future generations. Postscript: After a chat with Maureen Taylor (The Photo Detective), I have a better sense of all three photos. Of the two shown here, Maureen tells me that the style of dress and the provenance of both photos strongly suggests that we are looking at Edward Hughes Glidden, first in 1920–25 and then in 1905–10. As for the photo in my February blog post, the man shown there was photographed ca. 1932, and so cannot be Glidden. 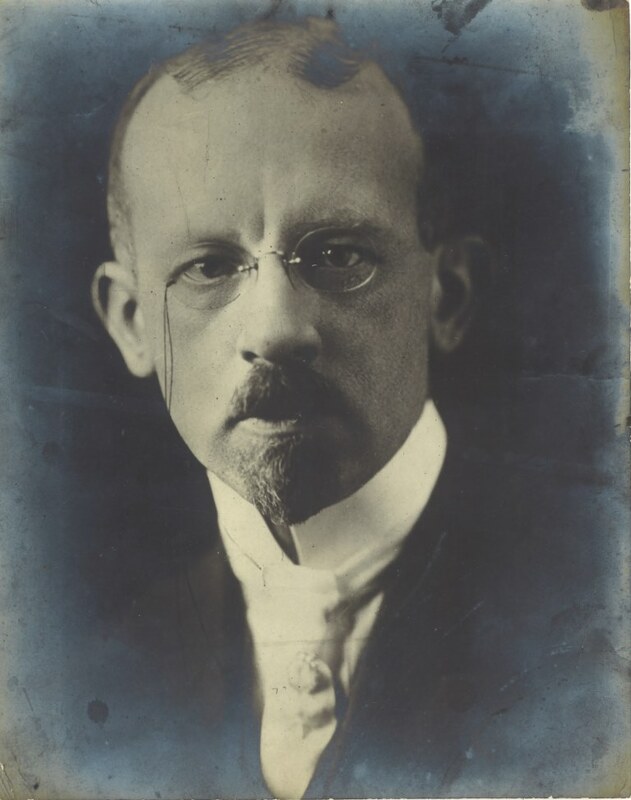 It could, however, be Clyde Friz, the other architect of the Homewood Apartments, who died in 1942. 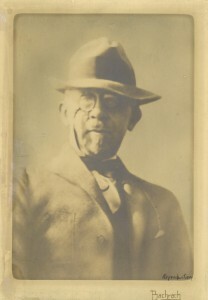 The Tuscany-Canterbury Architecture blog is a great resource for information on Glidden and Friz; a short biography of Friz (along with a photo) can be found here. Bravo Scott! Bravo! Well done. Enjoyed sharing this on the Maryland Genealogical Society’s Facebook page!